As you may already realized, New York fashion week is currently being held. What does that mean? Time to take out your best items you've been wanting to show off for quite some time. Personally, I'm not all about wild head-to-toe metallic prints. Sure, they are attention for street style photographers if you want to get noticed, but I prefer balance. Nothing says better than a well dressed man with confidence who knows how to keep a trendy proportion between color and accessories. I've been catching on the most recent menswear shows in New York, and as you know, I will have something bias to say about these collections soon. But for right now, I leave with a casually-formal collage I simply enjoyed putting together. Simplicity is sometimes even more luxurious. Want to know where to get these items? Burberry navy peacoat, J.Crew gingham shirt and dark green pants, A.P.C. 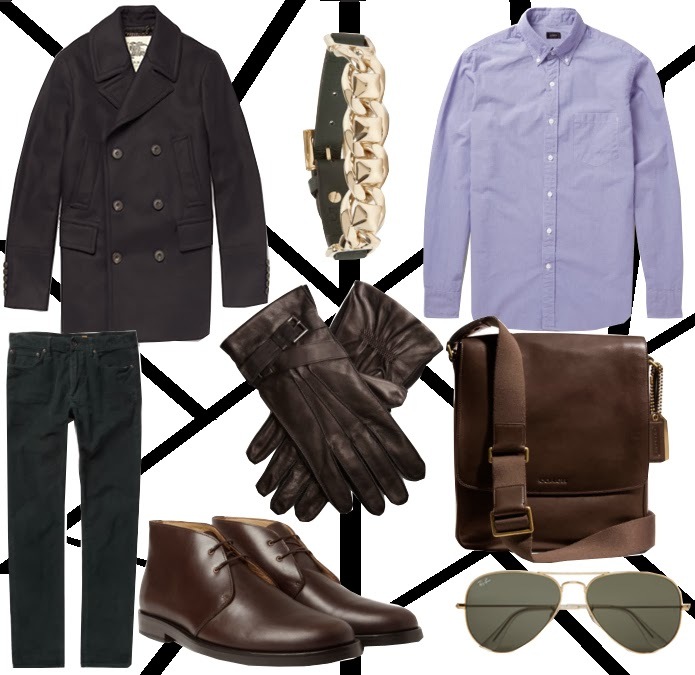 leather boots, Valentino leather bracelet, and Ray-Ban sunglasses - All available at Mr. Porter. Kenneth Cole leather buckled gloves and Coach bag, available online. What Do Prada, Gucci, and Versace Have in Common? Are Designer Jeans an Investment or a Status?